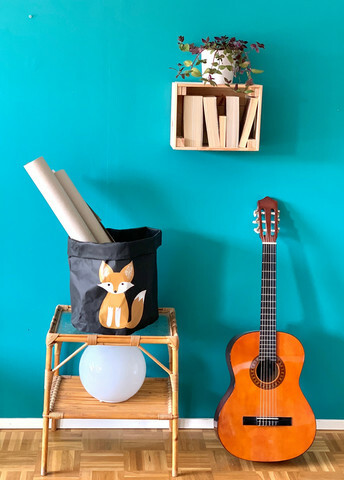 Fox is adventurous in the children's room <3 Lovely, children's own favorite! A basket with a lovely fox picture like toys. The product is made entirely of hand-washable paper. Each basket is unique and the craftsmanship is visible in the baskets. The material is so-called vegan leather paper, which is 60% plant-based cellulose and 40% natural rubber. The product is very resistant to wear and light. The material softens when warmed with warm water and then easily shaped to the liking. After curing, it becomes hardened to cardboard. The material softens in use and the more often it is washed. The material is felt and looking like paper. It's easy for a child to pick up toys from the basket!